Navigate your surroundings as you build on the vocabulary and essential language structure in Level 1. Learn to talk about your environment such as giving and getting directions, using transportation, telling time, dining out, enjoying basic social interactions and much more. 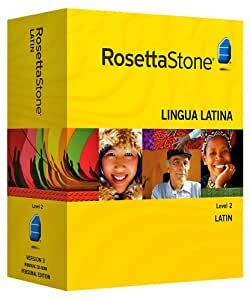 Rosetta Stone Personal Edition contains everything you need to give the voice inside of you a new language. The method used recreates the natural way you learned your first language, revealing skills that you already have. This approach has won numerous awards, and has been adopted by countless organizations, schools and millions of users around the world. Join the language revolution today. Only with Rosetta Stone. The comprehensive language-learning solution that fits your life. Learn your next language the same way you learned your first language. Dynamic Immersion empowers you to see, hear and comprehend without translating or memorizing. You already have this ability. Rosetta Stone simply unlocks it. Get feedback to move forward. You learn best by doing, and you'll apply what you've learned to get to the next step. Rosetta Stone adapts to your individual needs and skills, because you drive the program with your progress. Start speaking immediately. From the very first lesson, you'll speak. You'll begin with essential basics, which form the building blocks of the language. Soon you'll create new sentences on your own, using words you've learned. Best of all, Rosetta Stone is addictive. With every entertaining activity, you'll feel success. 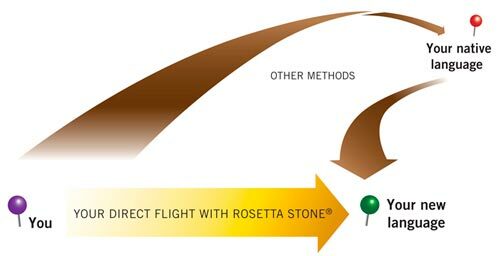 You'll want to use Rosetta Stone to have that next moment, that next breakthrough. So you'll keep using it, and you'll learn more! No translation or memorization required. The most effective way to learn a new language is to be surrounded by it. When you were an infant, your parents taught you this way, by intuitively associating words with images. That's the ultimate language lab, but most language-learning programs completely ignore this. Think about all of the ways you've tried to learn a language: classes at school, tapes and cassettes, even software that uses your native language as a base for your next one. What do they all have in common? Translation and memorization. Instead of taking a "direct flight" from your brain to your new language, translation and memorization connects you to your old language. You always have to "fly" from your brain, to your native tongue ... and then translate what you've memorized to communicate. That might work for a few words, but what happens when you get to a sentence or phrase? When you have to change tenses? You're going to make a lot of "connecting flights." That's why those other methods are so frustrating ... and why they fail. This method encourages you to think like a baby. You'll pair words with vivid, real-life images and make connections between things you know and the new language. Soon, you'll be thinking in a new language, stringing words together into phrases that you create. Rosetta Stone places this Dynamic Immersion method at the core of a suite of software that works with you to develop your skills. The simple, intuitive interface helps to keep you engaged in the solution, while advanced speech recognition technology makes certain that you're speaking correctly and accurately. Best of all, Rosetta Stone never leaves you behind. You'll only move forward when you're ready, when you've become comfortable and confident. With Level 2, you'll take all of the skills you've learned in Level 1 and see how they allow you to communicate and connect with the language. You'll give and get directions while learning about using transportation. In addition, Level 2 invites you into basic social interactions, where you'll dine out, tell time and more. With Audio Companion, you'll enhance the Rosetta Stone experience wherever you go. You'll learn new skills on the computer, and then reinforce what you've learned with Audio Companion. Simply play the CDs on a stereo or download them to a MP3 Player. Each Audio Companion activity corresponds to a lesson in the Rosetta Stone software, so you can turn your travel time into productive language-learning time.